It is always a pleasure when a fine pit orchestra sets the tone for a delightful musical even before the curtain rises. 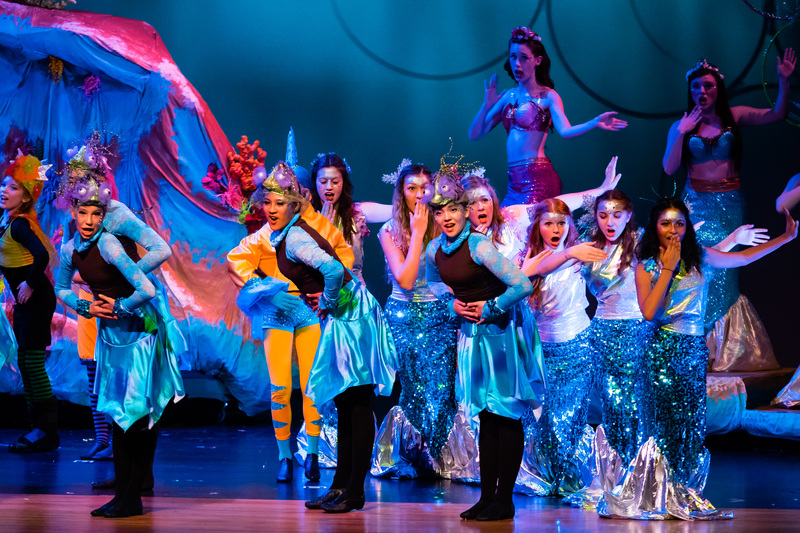 Such is the case when gifted music director/conductor, Rae Moses, leads his musicians in the Overture for Class Act’s sparkling current production of the cheerful Disney musical, The Little Mermaid. 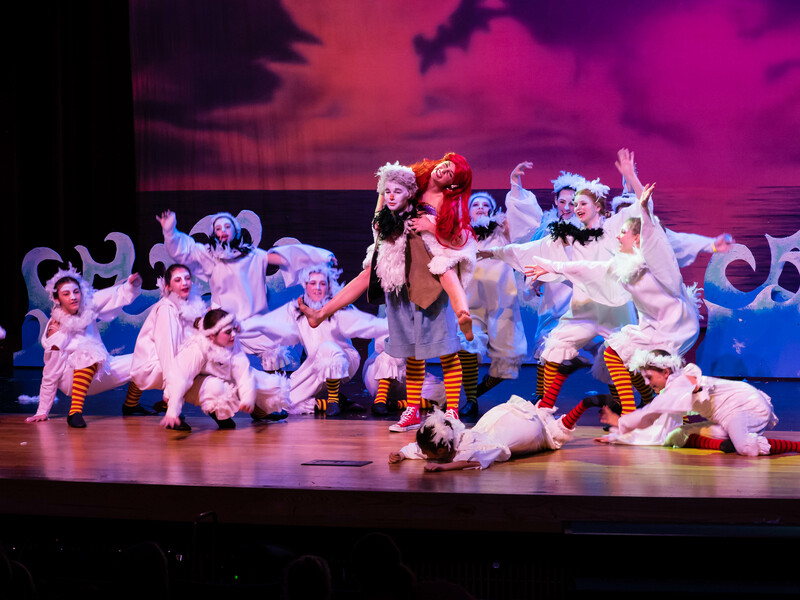 Inspired by the popular Disney film of the same name, the charming show features music of Alan Menken, lyrics by Howard Ashman & Glenn Slater, and book by Doug Wright. 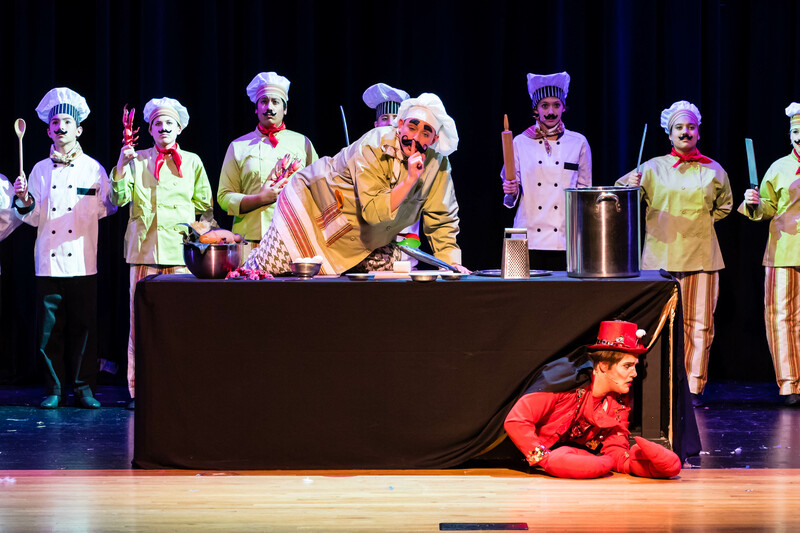 In the capable hands of veteran director, Tina Kraft, this eye-popping and joyful production would seem an artistic impossibility were it in any other hands than those of the Class Act Productions team now renowned as one of the country’s leading youth theatre programs. After nearly two decades of reviewing the work of this brilliant organization, I won’t hesitate to say that this extravagantly beautiful and creative production is one for the record books. The sweet fairytale is based on the original by Hans Christian Anderson. 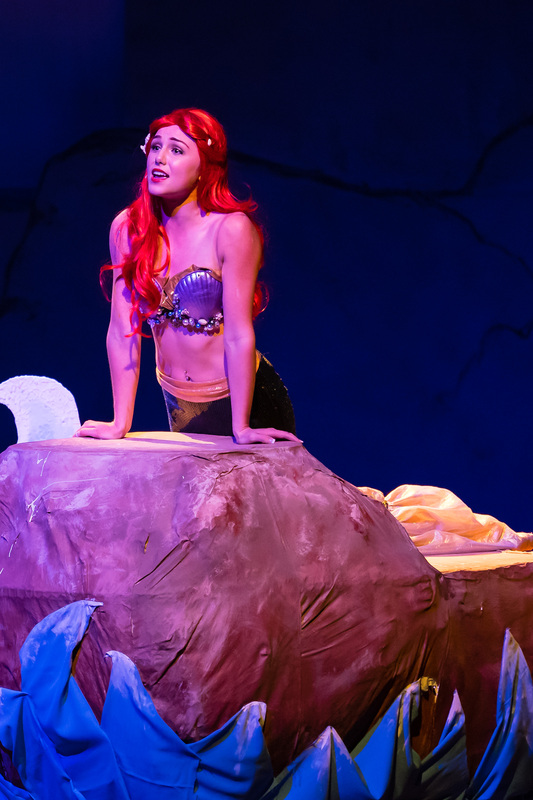 It tells the story of Ariel (Jenny Gee), a beautiful young mermaid who has the voice of an angel that is made very evident when Miss Gee delivers thrilling vocals like the stunning, “Part of Your World.” But Ariel is fond of slipping secretly on shore to see the world in spite of dire warnings from her protective father, King Triton (Jason Leach). During one such adventure she witnesses a shipwreck when a handsome young prince (Magnus Kroken as Prince Eric) is washed ashore. It is love at first sight for Ariel, but alas, as a mermaid she can never hope to walk in the prince’s world. 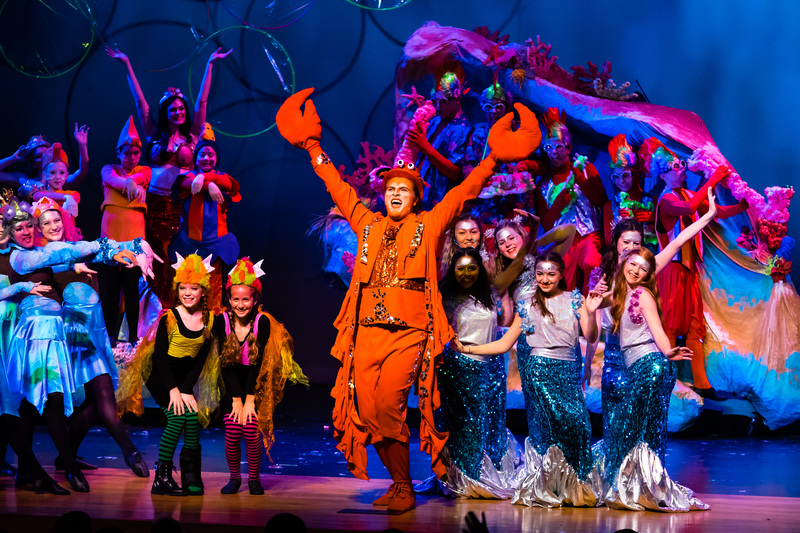 The king assigns a large crab named Sebastian (a riotous performance from Brad Brickhouse) to protect Ariel and prevent her from again wandering ashore. 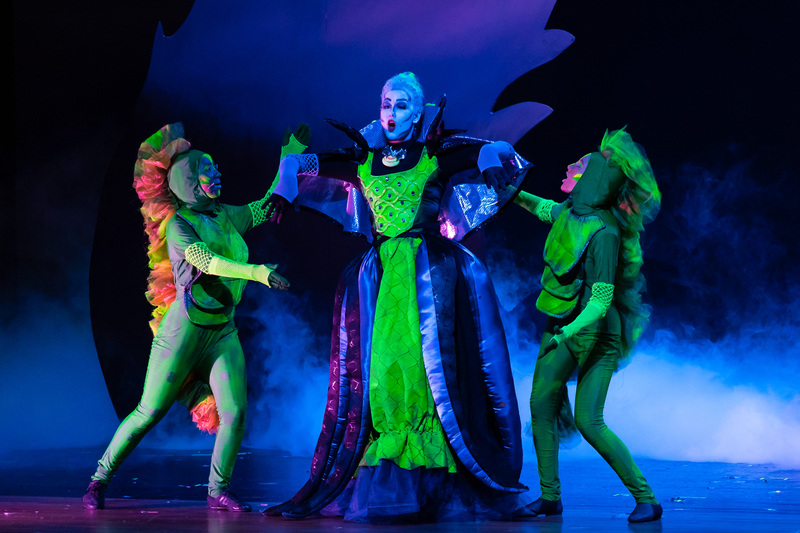 Complicating matters is the king’s evil sister, Ursula (a sinister Brenna Leilich) who is jealous of Ariel’s lovely singing voice and eventually tricks the mermaid into surrendering her voice in order to be magically granted the human legs that would allow her to walk in the prince’s world. To say more would give away too much of a plot that is already familiar to youngsters around the world. This truly spectacular production owes its deserved success to a number of factors. For openers, the very beautiful Miss Gee has an absolutely glorious voice that could have carried this role off on any stage, even Broadway. Her good-looking co-star, Mr. Kroken, is perfectly cast in the classic image of the eager young prince. Spicing things up with lively comic fun is Anderson McDaniel in the role of Scuttle, the leader of a rowdy band of seagulls. Then there is the larger-than-life performance of Mr. Brickhouse (an imposing figure himself) as the bright red and very large crab assigned to protect Ariel. He commands the stage hilariously on more than one occasion, and has a fine singing voice in numbers like the dazzling and calypso-flavored numbers, “Kiss the Girl” and “Under the Sea,” that have wonderful vocal ensemble backup from the cast that so typifies Class Act throughout this production and the many that have gone before. 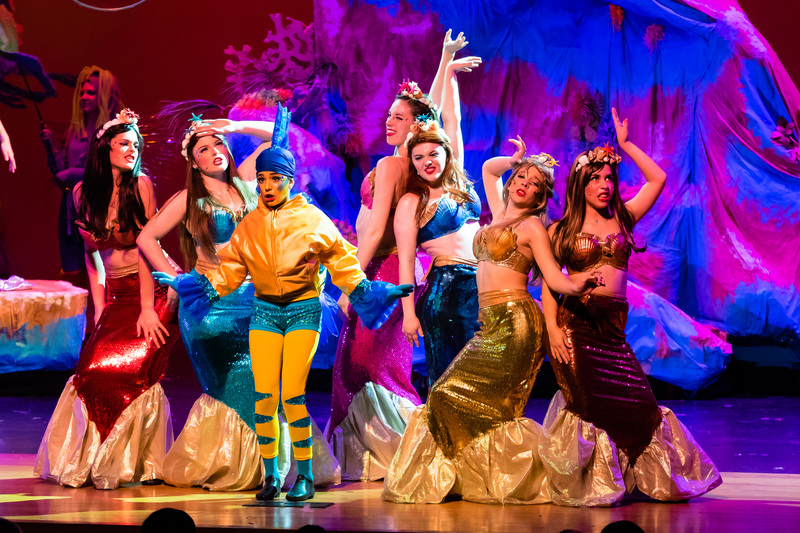 The show has countless other delights featuring Ariel’s six lovely Mersisters and the amusing Flounder (Clementina Franceschi Montserrat), a Lucille Ball-style zany performance from Toby Mustard as Chef Louis, and a group of lusty sailors accompanying the prince who arrive dramatically on stage in a gliding and beautifully crafted sailing ship. It must be mentioned that the costumes (designers, Laurie Lewis & Kristi Tabor) sets (designer, Jonathan Shelledy), and hair and makeup (designer, Kristi Durant), were all so gloriously creative and beautiful that during the intermission I inquired about how the package loan of materials from Disney Corporation had been arranged. I was then absolutely stunned to learn that the entire production had been created from scratch by the Class Act team. The wonderful choreography of countless block-buster scenes was designed by Kathy Ruth Rogers and beautifully executed by this marvelous cast of over seventy youngsters that ranged from grade school to college age. 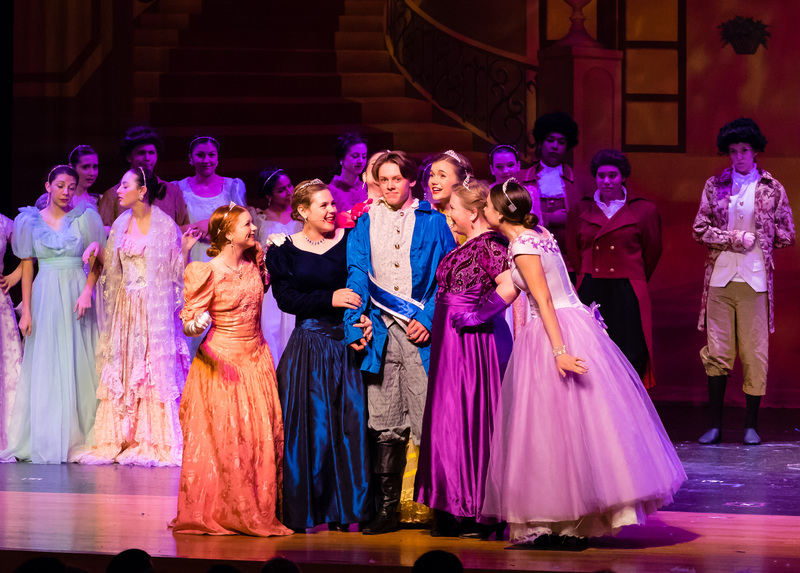 The sound designs of David Mallory, lighting designs of Blake Minor, and scenic artistry of Katie Arceneaux & Madison Crisp all beautifully combine to add the finishing touches to the splendor. Director, Tina Kraft, should be given a Cecil B. DeMille Prize for so beautifully coordinating this colossal undertaking. I’m sure Class Act Founder/President, Keith Brumfield, would agree. [CAUTION! While there were a few empty seats at last weekend’s well-attended opening, I suspect the word of mouth on this show will be cause for a much-deserved sellout at this weekend’s performances] THE LITTLE MERMAID continues at the Nancy Bock Center for the Performing Arts in The Woodlands, Texas, with three more performances this Saturday (2:30 pm & 7:30 pm) and on Sunday a final matinee at 2:30 pm. Tickets ($15-$30) can be purchased online at www.classactproductions.org, or by calling 281-292-6779. This entry was posted in Alan Menken, Broadway, BroadwayStars.com, Class Act Productions, Conroe Courier, Disney, Howard Ashman, Nancy Bock Center for the Performing Arts, The Courier Columns, The Little Mermaid, ThePeoplesCritic.com and tagged Broadway, Class Act Productions, musicals. Bookmark the permalink.